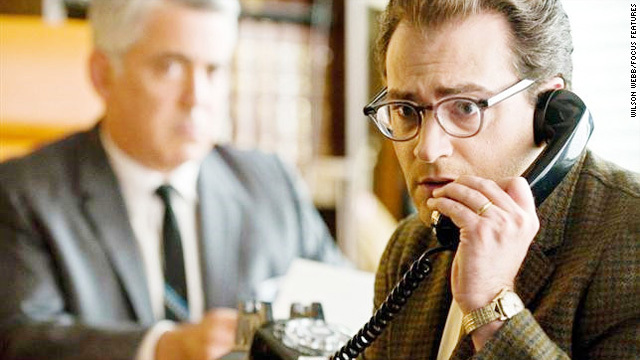 Larry Gopnik (Michael Stuhlbarg) finds himself at wits' end in "A Serious Man." Next up for actor: Playing Arnold Rothstein in "Boardwalk Empire"
(CNN) -- Michael Stuhlbarg didn't know which way his life would turn. The Coen brothers had auditioned him for one part in their new movie, but they decided to go a different direction. Then they had another part in mind, or perhaps a third. Stuhlbarg was left with uncertainty, adrift amid forces he couldn't control. It's sort of the predicament faced by his character in the Coens' film "A Serious Man," which was released on video Tuesday. The film and Stuhlbarg have been widely praised. Stuhlbarg was nominated for a Golden Globe as best comedic actor, and "A Serious Man" -- which was named to dozens of year-end top 10 lists -- is up for two Oscars, including best picture. CNN spoke with Stuhlbarg, who's been primarily known as a stage and television actor, in a phone interview. The following is an edited version of the interview. CNN: Congratulations on the best picture nomination. How did you get the role? Michael Stuhlbarg: Originally Joel and Ethan Coen brought me in to audition for the part of Velvel, the husband in the Yiddish parable in the beginning of the story. I had to go to a Yiddish tutor [to] learn the scene in Yiddish, which was fun. I had very little experience with that. I did the scene ... and then they weren't sure at that point whether or not they wanted to hire someone who could speak Yiddish fluently or an actor to just do it phonetically. They ended up going with folks who could speak it fluently. And then maybe about five months passed by, and they called me back to audition for the parts of Larry and for Uncle Arthur. And so I learned a couple scenes of each of those characters, and I read for [the Coens] and they laughed and that was really wonderful. And then I kept inquiring periodically afterward as to whether I was still in the running, and I kept hearing yes, I was still in the running, still in the running. And eventually I got a call saying I was going to get one of those parts, but they just didn't know which one yet. So I started working on both of them, and about six or seven weeks before the principal photography began, I got a call from Joel saying, "We'll put you out of your misery; you're playing Larry." CNN: This is the blackest of black comedies. Did you find the script thrilling or depressing when you first read it? Stuhlbarg: I laughed a lot, actually. Frankly, I thought it was high comedy. I found myself giggling throughout the entire thing. Maybe it's how specific [the Coens] are in the rhythms in which they write, or the background I was familiar with -- in being raised in the Jewish religion -- but it tickled me. CNN: Were you concerned when you saw the script, that this might be a little too Jewish, a little too esoteric? Or when you get a script from the Coen brothers, do you say I'm in, regardless? Stuhlbarg: Absolutely -- I'm in, regardless! If they want to use me, I'll do anything they want. I thought it was a hysterical screenplay, so beautifully constructed and written. And I thought it was also a universal story as well. We're all familiar with those times when things go wrong in our lives, and we do the best we can to try to sort them out. CNN: How does working with the Coens compare to your other film experiences? Stuhlbarg: Well, Joel and Ethan have been working with a lot of the same folks almost as far back as [1984's] "Blood Simple." So it's like joining a little repertory company of people who have been together for years. They have their own vocabulary, and the set is a well-oiled machine. So showing up there, there's very little that you have to concern yourself with other than doing your job. CNN: Have you been approached by rabbis, by clerics, by physics professors about the film? Stuhlbarg: Not so much. I actually sought out the help of a physics professor while I was doing my research before we started shooting. That was a big concern of mine. I wanted to feel secure enough to get up in front of a group of people and be able to clarify any questions that might come up discussing Schrodinger's paradox or the uncertainty principle. But I haven't spoken to many clergy. I've read some things that people have written on the film, but I've been somewhat removed from the reactions. CNN: What's up next for you? Stuhlbarg: At the moment, I'm filming a new HBO series, "Boardwalk Empire." (Stuhlbarg plays organized crime boss Arnold Rothstein.) It's going very well. It's a tremendous cast of actors and a wonderful group of writers, and a tremendous pedigree with Mr. [Martin] Scorsese executive producing, and he directed the pilot. CNN: Did "A Serious Man" have any effect on you in terms of reconnecting you to Judaism or thinking about the big questions in life? Stuhlbarg: Hmm. (long pause) I was pretty much able to leave the character at the door when I came home. ... But I found that the little quote at the beginning of the movie -- "Receive with simplicity everything that happens to you" -- I've taken that away with me as a kind of beautiful watchword of how I live my own life, to try to receive the difficulties of whatever it is that comes into your life with simplicity. And that's a blessing.